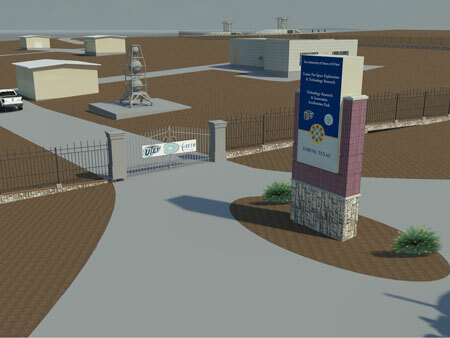 This rendering shows the front entrance of the planned MIRO cSETR Technology Research and Innovation Acceleration Park (tRIAc) in Fabens, Texas. The University of Texas at El Paso and The County of El Paso have announced collaboration on the new MIRO cSETR Technology Research and Innovation Acceleration Park (tRIAc) in Fabens, Texas, adjacent to the existing Fabens Airport. The partnership will increase regional economic prosperity via the new facility, where academic talents from UTEP will meet industry leaders who have been brought to the location to work on tomorrow's innovations and create new jobs for the area to improve the economy of Fabens and El Paso County as a whole. "This partnership marks a giant leap forward not only for research opportunities available to the University's students, but also for economic development that benefits our whole region," said UTEP President Diana Natalicio. "We are proud to be collaborating with the County of El Paso to realize this tremendous opportunity for our region to be seen as a major player within the aerospace industry," said Ahsan Choudhuri, Ph.D., chair of UTEP's mechanical engineering department and director of the University's Center for Space Exploration Technology Research (cSETR). The County is contributing acreage and structural support while promoting the area as a strong economic bolster while the University's cSETR will lend federal funding and student talent to attract industry leaders to the Fabens site as part of its continued commitment to meet the demand for engineers in aerospace and federal labs, particularly in combustion and propulsion. Current cSETR partners, including NASA, the U.S. Department of Energy, Lockheed Martin, and the Missile Defense Agency, will have projects housed at tRIAc. cSETR's mission also addresses the underrepresentation of Hispanics in this sector and has a strong track record of graduating students from the UTEP Mechanical Engineering program at a higher rate than the state and national average. "The last 100 years of UTEP's history were about giving tools to students to be successful. But then graduates, especially in engineering, leave town because that's where the employers are. For UTEP's next hundred years, our goal is to keep graduates here at home. Efforts like tRIAc are essential to achieve that goal," Choudhuri added. The 10-year timeline of tRIAc's development will encompass construction, grant funding, and the implementation of projects by the previously mentioned entities.